Have you always wanted to call into 'Wait Wait Don't Tell Me,' but didn't want to embarrass yourself or your family? Well, now you can play along with Peter and Bill without risk to your reputation thanks to NPR's new Wait Wait Quiz for smart speakers. NPR's comedy news quiz show is now available as a fully interactive game for your Alexa or Google enabled device. 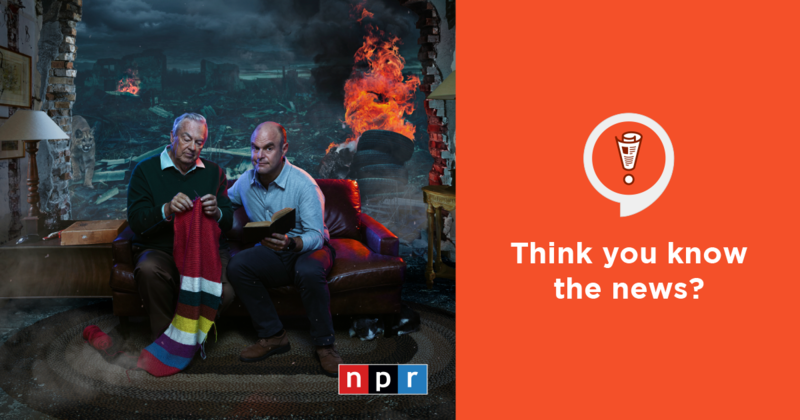 Hosted by Peter Sagal and Bill Kurtis, you will get the chance to answer fill-in-the-blank questions from this week's news. It's just like the podcast or radio show, but Peter and Bill can hear and respond when you shout at them. Simply say to your device, "Alexa, open Wait Wait Quiz," or "Hey Google, talk to the Wait Wait Quiz," and you're playing. Play every week for a chance to win the Wait Wait voice of your choice on your voicemail and hear your name on the air! NPR's Ari Shapiro, co-host of All Things Considered, plays the new quiz game from Wait Wait Don't Tell Me designed for smart speakers. Think you can beat him? Try the Wait Wait Quiz on your home smart speaker! With the Wait Wait Quiz, Wait Wait becomes the only comedy quiz regularly updated for smart devices. The quiz updates weekly and takes roughly 5 minutes to play alone or with friends. Prove your knowledge of the week's news and give Peter and Bill a piece of your mind. Try it out today-- you can't lose! Well, technically you can. Developed in collaboration with VaynerSmart (VaynerMedia's internet of things division), this new quiz will be available on your smart speaker each week. According to NPR's latest Smart Audio Report, more and more people are buying and using smart speakers. After the Holiday surge, a reported 53 million people (that's 21% of the adult population!) now own at least one smart speaker – and NPR content will be right there, meeting listeners wherever they go. For listeners on more than 720 NPR Member stations, Wait Wait has become the go-to place to laugh about the news. Debuting as one of NPR's first podcasts, Wait Wait has earned a spot among the top 20 podcasts by US audience as measured by industry ranker Podtrac. The Ringer recently described the program as "radio's most entertaining and enlightening trivia program."